, a native of Norfolk, was elected fellow of C. C. C. Cambridge in 1536, proceeded M. A. the year following, became their steward in 1539, and not long after obtained leave of the society to go and study abroad for a limited time; which he afterwards procured to be extended for two years more. 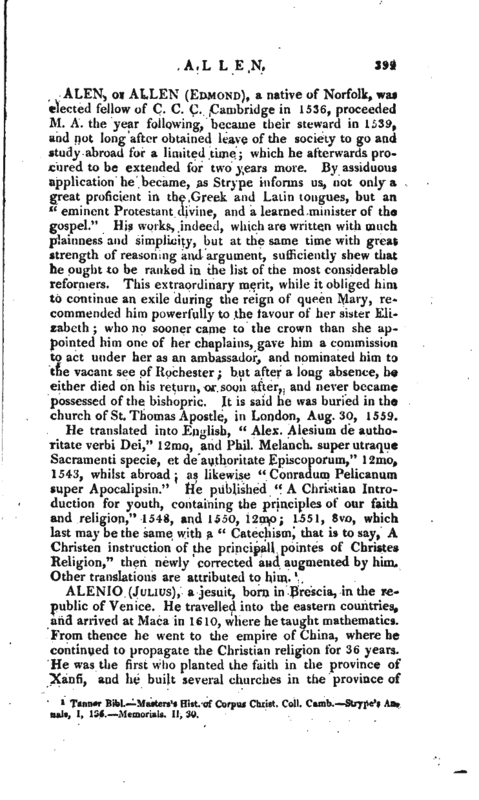 By assiduous application he became, as Strype informs us, not only a great proficient in the Greek and Latin tongues, but an “eminent Protestant divine, and a learned minister of the gospel.” His works, indeed, which are written with much plainness and simplicity, but at the same time with great strength of reasoning and argument, sufficiently shew that he ought to be ranked in the list of the most considerable reformers. This extraordinary merit, while it obliged him to continue an exile during the reign of queen Mary, recommended him powerfully to the favour of her sister Elizabeth; who no sooner came to the crown than she appointed him one of her chaplains, gave him a commission to act under her as an ambassador, and nominated him to the vacant see of Rochester; but after a long absence, he either died on his return, or soon after, and never became possessed of the bishopric. It is said he was buried in the church of St. Thomas Apostle, in London, Aug. 30, 1559. Tanner Bibl.- Masters’s Hist of Corpus Christ. Coll. Camb. —Strype’s Anali, I, 136. Memorials. II, 30.